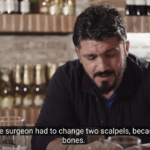 There have been many stories of Zlatan Ibrahimovic playfully abusing his teammates over the years, but what sets Thiago Silva’s latest tale apart is that the victim is Rino Gattuso, another man known for his ferocity, albeit of the more compact variety. “The protagonist of this story is Zlatan Ibrahimovic,” Brazil international Silva said. “One day, during a training session, Gattuso spent all morning teasing Zlatan. He was provoking him, and Zlatan took it without apparently saying anything. In fact his revenge would come soon after. “Rino and Zlatan met again in the dressing room after training, and Ibra lifted the entire weight of his team-mate, flipped him over and threw him in the bin! Putting Rino Gattuso in a bin is like putting a mountain lion in a bin. It’s just not a good idea. And yet, Zlatan got away with it. This probably wouldn’t have worked out as well if he tried it with Oguchi Onyewu, though.